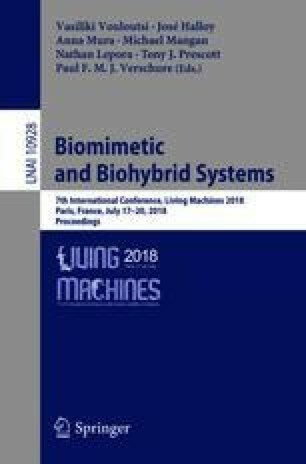 Insect antennae have been repeatedly proposed as paragons of active tactile sensors for biomimetic robots. A challenging aspect of using insect-like feelers for tactile localisation concerns the compliance of the long and slender structure of insect antennae. Other than in a rigid sensory probe, where the contact location in space may be estimated from the pointing direction and contact distance along the probe (polar coordinates), the strong compliance of insect antennae during contact events raises the question how insects can localise contact positions in space. Here we study the stick insect antenna to address this question. Our main objective was to test whether and how the bending properties of the insect antenna may allow reliable estimation of spatial contact locations through an array of bending sensors. During walking and climbing, the stick insect Carausius morosus executes cyclic antennal movements to explore the ambient space ahead. When the antenna touches an obstacle, it often bends strongly. Nevertheless, the insect can reliably reach for the contacted obstacle. Here, we systematically deflected insect antennae with an industrial robot to mimic an array of static contact locations. Then, we measured the resulting curvature of the flagellum, assuming that campanifom sensilla distributed along the flagellum could encode the corresponding bending profile. We found that we could train an artificial neural network to estimate the contact positions in 3D space with an accuracy of 0.5 mm or less from a given set of curvature data. This suggests that the bending characteristics of a tactile sensory probe could be tuned to aid spatial localisation by contact-site-dependent, compliant deformation.